Lingerie Thong and G-String (Dreamgirl): Assorted Thong (1347). 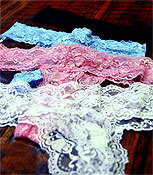 Stretch lace thongs available in Black, Baby Blue, Baby Pink. Made of 90% Nylon, 10% Spandex.